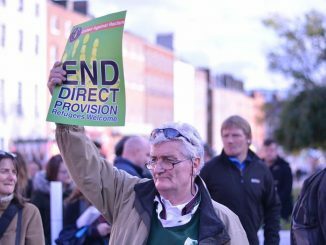 The Direct Provision System (DPS) is the main feature of a legally very complex, bureaucratically and politically non-transparent, commercially profit and private business driven, at the core inhumane and institutionally racist asylum system in Ireland. To understand the DPS we need to understand the role it is playing in Ireland’s asylum process. DPS, introduced as a temporary ‘measure’ in 1999 provided the best cover for Irish governments over the past 17 years not only to continue with their unwelcoming asylum polices, but also to get away with the unforgivable inhumanity of the official state response to asylum seekers. In fact the entire asylum system is based on single-simple logic: keeping the asylum seekers out. If possible, out of Ireland altogether, but, if that fails, out of sight and out of public and social life, in other words, out of minds. It is designed to ensure the asylum seeker don’t sink roots in this country while the state considers various options about their lives, the least likely being granting them refugee status, because the state knows that people with roots are much harder to deport. Their friends and, crucially, their workmates are their children’s schools etc. are likely to defend them. DPS should be examined and understood within this context. As we explore some of the aspects of the DPS, we must recognise one simple fact. DPS was (and still is) not a well-intended but somehow unfortunately failed system but a crucial and purposeful one designed to maintain the institutionally racist asylum policies of the state. Hence, each and every government that came to power since the introduction of the DPS ignored dealing with it as best as they could. For governments of Fianna Fáil, the Green Party, the Progressive Democrats, Fine Gael, and the Labour Party the ignoring of equality, democracy, transparency and basic human dignity for asylum seekers did not matter. Not only did they ignore the ever growing problems of DPS but they also ensured its permanent nature by introducing new and additional laws to safe guard it. The 2004 Citizenship Referendum engineered by the government of that time removed the right to citizenship from children of ’non-nationals’ who are born in Ireland. This referendum had the specific aim of dealing with asylum seekers and their Irish born children. 17 years later, there are currently more than 500 children born in DPS. More than 1,600 children are growing up in DPS with limited access to play or recreational facilities (1). The lost childhood of little asylum seekers is summarised in one simple fact: children cannot invite their friends to play in what they call ‘home’, the direct provision centres. To fully understand the true meaning of DPS we also need to see it within the context of the wider refugee application process and the historically very low rates of granting refugee status to asylum seekers. Ireland ranks significantly below the EU average in granting refugee status. Austerity and current economic crisis cannot be used as an excuse for this shamefully low rate. This was also the case during the so called ‘boom’ years of low unemployment. The United Nations (UN) has a vast database (2) of very detailed asylum numbers tracked and reported by the UN Refugee Agency UNHCR. This database is available to any researcher to draw conclusions from. Including the pending and first time applications within a given year, between 2000 and 2014 the average approval rate in Ireland was only 4.22%. The EU average for the same period was 6.78%. This does not mean 95.78% of the applications to Irish state were rejected. In a given year the state will often simply not make a decision, leaving cases pending, sometimes for many years. The average actual rejection rate in Ireland was 37.7%. In the same period, so on average 43.9% of the applications were not processed. In other words, the asylum seekers were forced to stay in DPS. Between 2000 and 2014 90,000 refugee applications were processed. Of these 9,500 were granted and 79,000 were rejected. On average, for each person the state granted refugee status, 9 asylum seekers were rejected. For rejected – as the official language calls them ‘failed’ – asylum seekers the options available are: an appeals process, which is a long and costly legal battle with Department of Justice; to be granted the status of ‘leave to remain in Ireland on humanitarian grounds; subsidiary protection status; if all fails, deportation. The leave to remain and subsidiary protection statuses are a ‘fuzzy’ area which gives asylum seekers no sense of permanent solution or settlement in Ireland. These give the state total control over their lives and their future. Without the right to permanent residency and citizenship they are at the mercy of political choices of governments. According to the Office of the Refugee Applications Commissioner (ORAC) as of April 2016, there are 2,303 refugee applications outstanding (3). Irish Naturalisation and Immigration Service (INIS) figures show that around 3,800 people were deported from Ireland in 2015. The numbers of annual asylum applications have fallen from 16,000 in 2000 to less than 2000 in 2015/16. But even with these much smaller numbers the Irish state has not moved to change the conditions of asylum seekers. DPS was not introduced as a temporary measure to accommodate asylum seekers in Ireland while the state processed their refugee applications. It was introduced in a ‘panic’ as a result of long and non-transparent processing times of refugee applications and the high rate of rejections that followed. For many people in DPS life is suspended for many years, till such time comes when they are eventually, in very small numbers, given refugee status or ultimately removed from the country. DPS was supposed to provide shelter for six months as an ‘emergency’ measure. 17 years on, it has become a permanent feature of the asylum process in Ireland and numerous research reports showing its dysfunctional, inhumane, and institutionally racist nature have been ignored by the governments of the past. Today, the same arguments are used to justify the closure of European borders to refugees and condemn thousands of war victims to death in the Mediterranean at the gates of ‘Fortress Europe’. The Irish Government was examined by the United Nations Committee on Economic, Social and Cultural Rights on the 8/9 June 2015 in Geneva. 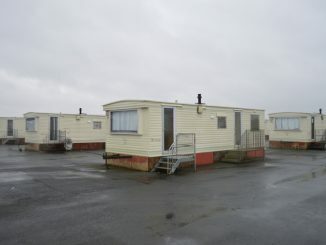 The Direct Provision System was described as a severe violation of human rights. Today, many asylum seekers spend years in DPS, trapped in conditions that are damaging to the health, welfare and life-chances of those forced to endure them. 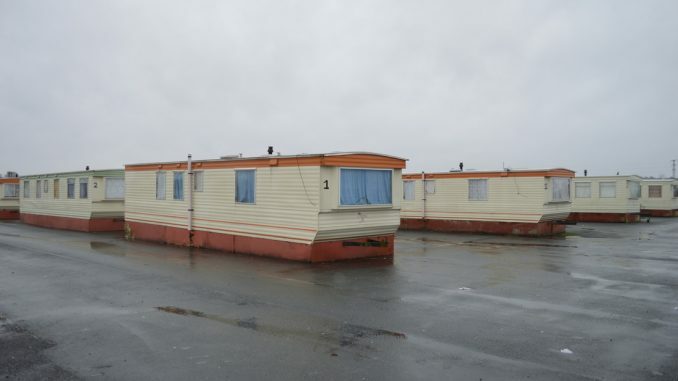 Direct Provision accommodation centres have become isolated, invisible ‘holding’ places where the state can forget about the asylum seeker residents. Asylum seekers in DPS are not allowed to work and are not entitled to social welfare. They are excluded from social housing and free third-level education among many other public services. In 2000, the state introduced a weekly allowance of €19.10 per adult and e9.60 per child (increased to €15 in 2016). The adult allowance has remained the same for 17 years. It is literally impossible to live any sort of decent life on this income. This has been well documented by numerous state and non-state agencies, by national and international human rights campaign groups. As of 2016 there are almost 5,000 people in DPS. 18% are in DPS for more than 7 years. Only 23% are in DPS for less than a year (7). The average length of stay is more than 3 years. Despite numerous calls, including from high profile public/political figures such as the President of Ireland Michael D. Higgins or the former judge Bryan McMahon the current government continues to ignore the problems of the DPS and the long waiting time asylum seekers are facing. Former judge Bryan McMahon called for an immediate, once-off amnesty to any asylum seeker in the system for more than five years, as a ‘gesture of generosity in the spirit of the 1916 celebrations’ (8). But the talks to form the current Fine Gael lead government excluded any move on DPS and even the most limited changes for addressing the issues facing asylum seekers were dropped from the program for government. There are many such problems: overcrowding in accommodation centres, lack of privacy or proper family life, food issues, exclusion and poverty are some of them. Another significant problem is the absence of independence and self-determination. In 2013, the State’s Special Rapporteur on Child Protection, Dr Geoffrey Shannon, raised concerns that many children are living in state-sanctioned poverty and in environments that could prove highly damaging. He said, ‘We are in a situation where we treat children in direct provision as being second class citizens’. Although asylum seeker children have access to primary and secondary education, they are not entitled to fee free third-level education. Only a tiny few have had access to third level education. 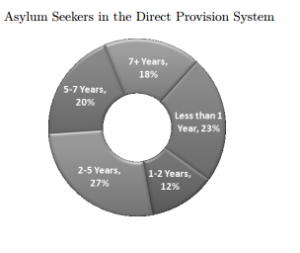 More than one third of the asylum seekers in DPS are children and teenagers. Their future is as bleak as ever. No access to third-level education is condemning them to lifelong economic discrimination and poverty. In 2014, the outgoing Ombudsman for children, Emily Logan, said ‘the treatment of children living in direct provision centres for asylum seekers is an issue of ongoing concern which the state urgently needs to address. Children should not grow up in direct provision’. Mental health and wellbeing is a constant concern. The facilities in accommodation centres are at best designed to serve for a very short time but people are living in these conditions for many years. Depression and mental health issues among asylum seekers in DPS are up to five times higher than in the wider community. A study carried out by the Royal College of Surgeons found the length of the asylum process was closely associated with an increase in psychiatric illnesses. In 2014, residents in number of centres staged protests over food, hygiene, general living conditions and the long waiting times for their refugee applications to be processed. Visiting one the centres, the Labour Party Minister of State responsible for Equality, New Communities and Culture, Aodhán Ó Ríordáin, said ‘the direct provision system was not humane and needed to be reformed as a matter of priority. I won’t stand over a system of people living in limbo for years on end. It’s not acceptable that children have to grow up in direct provision centres.’ As it turned out, there was no limit to the inhumanity of the past and current government. Aodhán Ó Ríordáin is gone but the conditions in these centres remain the same. Currently there are 35 DPS accommodation centres in Ireland. The state contracts out the ‘business’ of running the DPS centres to private companies. All except seven of these centres are owned and run by private companies. The conditions and standards in these centres vary. Many of the private companies providing food and shelter are large firms involved in the property, hospitality or catering businesses. Direct Provision Centres are just another business-for-profit for these companies. The entire DPS is a multimillion euro industry. Some of businesses have accumulated millions but because many have created ‘unlimited companies’, their accounts are shielded from public view. One of the companies with published accounts, Fazyard Ltd has accumulated a profit of €10.8 million (9). Another company, Mosney Holidays, has been paid more than €100 million by the state. Owned and registered by an Isle of Man parent company, Mosney made a €4,050 political donation to Fianna Fail in 2009. Aramark had a turnover of €223 million in 2013. Barlow Properties received €40 million from the State for running five direct provision centres. East Coast Catering has received €90 million since 2000. Bridgestock, in Roscommon has received €68 million. Direct Provision Centres are not independently monitored and inspected. Asylum seekers are not the owners of their ‘homes’ but forced customers of this state private sector business deal. As in everything else there are huge public funds available for private companies to do the ‘dirty’ work of DPS. These sums are wasted public funds that could be used to provide housing and other social services for asylum seekers. But this is a price Irish governments are willing to pay to keep the DPS in place. Despite the State’s claims that the DPS provides the best value for money, all international and national research available is consistent in showing that the system violates asylum seekers’ basic rights to housing, family life, food, health, work and education and is also economic madness. 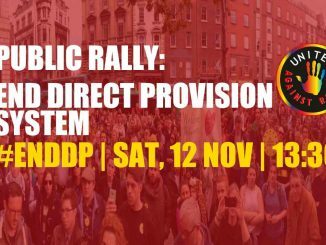 Direct Provision is a system of inequality and oppression. It is racist by nature. The longer it exists the worse the problems are getting. Its damage to many people’s lives is already beyond repair. It has hurt enough people and it must be ended to be replaced with a system that gives the asylum seekers the right to work, housing and other rights. All asylum seekers in DPS should be given full entitlement to residency and citizenship. Ireland must declare an end to deportations. The overall refugee application process must be changed and a humanitarian, transparent and care-oriented system should be put in place. Ireland has the capacity, capability and the means to look after these suffering people. What is missing is the political will of the rulers. Asylum seekers coming to Ireland and other European countries do so out of necessity and not choice. These necessities arise from the current dominant economic and political system in the world. In this system, for the rich to go around the world in pursuit of more profits and investment opportunities, to settle in any country they want and to pick and chose where they want to pay their taxes (or not) is presented as a ‘natural right’ of capital. But for asylum seekers and refugees to seek protection and safety, and migrants to follow jobs across borders is always defined as a problem. Hence the asylum seekers in Ireland are firstly described as a problem and only then as human beings. The State sees itself as a victim having to deal with this problem. In fact it is the opposite; DPS is the problem and asylum seekers are the victims. Asylum seekers exist because people have fled countries due to events with life threatening consequences. Such events could be wars, conflicts or environmental disasters or chronic poverty and starvation, or the oppression of people by their government. Throughout recent history imperialism and global capitalism are at the root of this forced migration. From the Palestinian Nakba to numerous dictatorial regimes supported by Western rulers; from colonialism and famine in Africa to imperialist wars in the Middle-East the actions of the ruling classes of the world have repeatedly created refugee crises and asylum seekers. Their actions in far-away places come back as asylum seekers and refugees which then face discriminatory racist policies of these states. I described the roots of the refugee crisis more fully in a previous article (‘The Roots of the Refugee Crisis’ Irish Marxist Review 14). Asylum seekers in Ireland today are a product of all of the above. In Ireland there is enough wealth to house, educate and feed every person. But the society is organised and run by the profit driven capitalist system. The state and political rulers ultimately defend the rich at the top and their national-international business interests. In the process, creating refugees and asylum seekers and trapping them in systems likes the DPS is not a concern for them. The state and governments that have condemned the asylum seekers to DPS are the same state and the same political rulers who have also condemned tens of thousands of workers to unemployment, many families to homelessness and to poverty, Travellers to discrimination, women to oppression and refugees to death. We must oppose the existence of the Direct Provision System and demand the normalisation of the lives of asylum seekers, to start with. It is by this we can continue on to fight for a different world. A world that is not only necessary but also possible. From you aghast in wonder’.